U.S. Rep. Al Green, a Houston Democrat, introduced formal articles of impeachment against President Donald Trump on the House floor Wednesday but there was little enthusiasm for the move even among Green's Democratic colleagues. 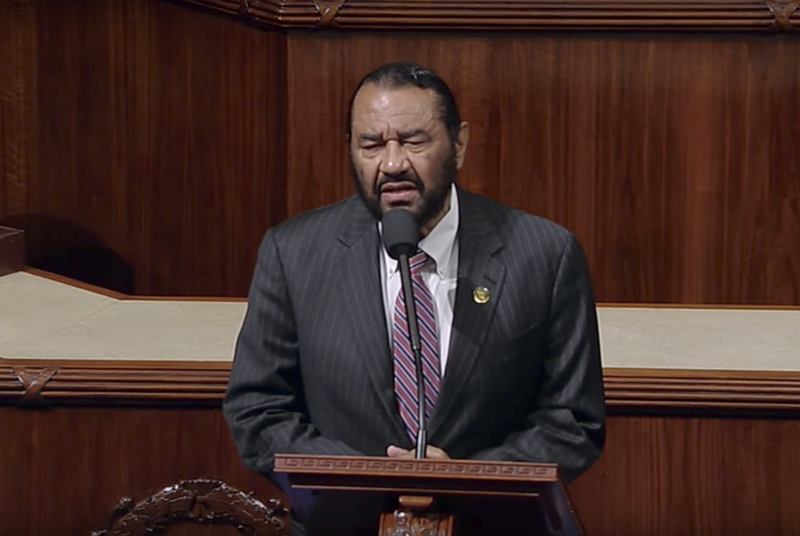 WASHINGTON – U.S. Rep. Al Green, a Houston Democrat, introduced formal articles of impeachment against President Donald Trump on the House floor Wednesday, then abruptly stepped back from the measure later in the day. In his argument for impeaching the president, Green read out several of Trump's tweets, arguing that his statements on several recent national controversies had “incited bigotry” against various minority groups, including African-Americans playing in the National Football League, transgender individuals serving in the military and Puerto Ricans recovering from a natural disaster. During his long-shot impeachment pitch, Green also criticized the president’s failure to condemn an August white supremacist rally in Charlottesville, Virginia, and called Trump out for claiming to have won the popular vote in November’s presidential election. Just before the first round of afternoon votes, the presiding officer of the House floor called on Green to offer his resolution to move forward, but Green did not appear on the floor. Green later told reporters that he wanted to allow more time for his colleagues to examine the legislation. But there was also active pressure put on the congressman to stop the effort, according to a half-dozen House Democratic sources who spoke to the Tribune. In the immediate aftermath of his speech midday Wednesday, it was unclear whether Green's move would force the full House to vote on impeaching Trump or if Green planned to push for such a vote. There is little enthusiasm for this effort among Green's own Democratic colleagues. Sources close to House Democratic leaders tell the Tribune that senior Democrats discussed last week how to deal with the issue in a leadership meeting. A senior House Democratic member told the Tribune that there is a concerted effort on the part of the party's House leadership as well as some members of the Congressional Black Caucus to shut down Green's impeachment effort. With Democrats in the minority in both chambers, there is little chance an impeachment measure could move forward – particularly before special counsel Robert Mueller releases his report on Russian interference in the 2016 election. Pelosi and other Democrats have consciously avoided making impeachment a central theme of the 2018 midterms. Such a move could alienate moderate voters viewed as crucial to Democrats hope of taking back power in 2019. But voting down an impeachment measure could put every rank-and-file Democratic member at odds with his or her base when they run for their own re-election next year. Green is the second Democrat to introduce articles of impeachment against Trump. U.S. Rep. Brad Sherman of California was the first to do so in July. Green, a relatively obscure member of the sprawling Texas delegation, earned national attention in May when he delivered a speech on the House floor calling for Trump's impeachment. Later that month, his office released racist and threatening voicemails he had received — some saying the black congressman should be lynched — in reaction to the speech.